(In slow motion): "You're ... you're crazy man. I like you, but ... you're craaaazzzzy." Anyway, first day on the job was today and I had to play pinch-hitter for a teacher who needed to head out of town on a family emergency. Even though teaching isn't in my job requirements (it's times like these when I have upper-management written all over me) I accepted the last-minute task...and found out on my very first day that kids are really not my forte. Don't get me wrong, they were all well-behaved and all past that point where they poo themselves for fun (we're talking 6th grade+ here), but I am just completely out of my element when it comes to kids. Think Will Farrell in the pool party scene in Old School -- just without a dart in my neck and any of the slow-motion yelling. Such was the way I expected it to be today, just without all the food fights and candy. But it was even more anti-climactic than I thought and it made me question whether I had issues of my own. Like when I first met the kids I automatically spoke very slowly and loudly, as though they were both mentally challenged and deaf (neither of which they were). This did not start things off on the foot I had planned, as they probably wondered what was wrong with me. I kept silently reminding myself that they were just normal kids, not mentally disabled, illiterate mutes, but it didn't matter. I kept talking slowly. Kept talking loudly. My mind was yelling at me to stop but my mouth did otherwise. When they had questions, I gave them explanations. When the explanations didn't make sense to them I wanted to stab myself in the eye with the nearest #2 pencil. And I get it -- they can't be expected to know everything (hence why they are being tutored for Christ's sake), so what did I expect? That they had been briefed in all levels of math up to Calculus, could analyze Nietzsche and engage in a spirited and coherent health-care debate? Of course not, they're only kids. So I would re-explain things slowly. Loudly. In my head I was smacking my head continually on a pretend desk, asking myself "Who the hell are you?" After the excruciating hour was over, I got home and asked J: "Do you think I'm bad with kids?" He said no, but now I'm beginning to wonder. I felt like that maternal instinct in me as a woman was missing. Instead I felt like an awkward zookeeper caring for a bunch of baby chimpanzees -- they're cute and all but I found myself asking "what am I doing here?" as I went over long-hand division with them. All this makes me wonder if I'm missing that motherly gene entirely, which scares me because J and I do want kids eventually. Maybe it makes a world of difference when they're your kids and not someone else's? Is this just what people in denial say? Ugh anyway, this is by no means a start to a new career. J and I need some extra cash these next few months and this was just a way to make a bunch of money (32 bones per hour -- which is more than I made at my desk job -- plus compensation for all travel time) while maintaining a highly flexible schedule with no set hours (I can supervise as much or as little as I want). This was the biggest perk since it definitely allows me to keep writing as my number 1 priority. Anyway I'm overseeing (read: overseeing, not teaching) eight after-school programs and hopefully won't have to fill in for any other teachers anytime soon. If I do, next time I may come armed with candy. And a dart in my neck. You know, there are studies that chimpanzees that aren't raised in a troop don't know how to care for a baby at all--they leave it places instead of carrying it with them, for example. In other words, parenting is a learned skill for primates. And it's tough to get thrown into a classroom, because you have no idea where they're at developmentally. One advantage of starting with babies and sticking with them is that you can see the progression. Sounds like the job not only leaves you writing time but is going to be good fodder! Eh, it is different when they're your own. I never liked kids, never even babysat when I was younger. I always said I was never having kids and I have two. Luckily, we finally figured out what was causing all the pregnancy and put a stop to the madness. Honestly, I still don't really like other people's kids much. But I like my own (most of the time). The trick is to show no fear. They can smell it and then they use it to their advantage. i feel the same way about kids...when i'm outnumbered, i get slightly nervous and freak...but i want my own someday...i'm always scared i'm going to psychologically damage one! I went from being the parent of 1 dog to a "bonus parent" of 3 kids in age ranges of 3 to 10. I don't want any of my own, and still don't, but BF claims I am really good with them. Awkward zookeeper thing? Oh yea, that's totally me!! LOL!! 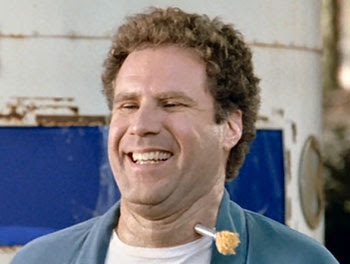 I would take Will Farrell any day over a stuck up teacher. I'm sure you did great, and congrats on the job! My mom was a teacher for 30 years. I substituted for four hours one time after I graduated college -- it was the longest, most excrutiating four hours of my life (They were fourth graders!) I just don't have that teaching gene in me, not on a regular basis or extended time period anyway. But I can tell you that I was never much into kids either. I still don't like other people's kids or even babies for the most part. I like them from afar but don't get too close, you know. But I'm different with my own daughter. So I don't think you should lose hope about that maternal instinct yet. Just give it more time. You ARE different when you've grown that baby within in and watched it grow every day. Very different than being a babysitter for others' children. Maybe next time you could give the kids a writing assignment? That is something you're great at and may give you more confidence in that kind of element/situation again. First, yay! Congrats on the job! Second, I totally can relate to this. I'm terrible with middle-school age children. My best friend is a 7th grade English teacher and she's amazing with her kids. The few times she's invited me to come speak in her classroom, I've gotten totally awkward. I guess I just don't know how to connect with kids that age, at least right now. So, don't worry, you're not alone in this feeling. I think you will be just fine. Don't stress about being a mother. No one is actually good at it. Otherwise, we would all be perfect. Why do you think there are a million parenting books? Yeah....you have nothing to worry about.